Follow our easy instructions to make a unique wire birthstone angel pin for yourself or a special friend. This is a lovely gift to make or wear for the Christmas season as well. Wrap wire around your fingers (I used 3 fingers), approximately eight times to form the body. Repeat the first step but wrap wire around your fingers just a little tighter, making only about three wraps around to create the wings. 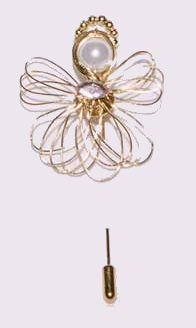 You should now have wire oval shapes, approximately one and one half inches tall for the body and about one and one quarter inches for the wings. Referring to the photo for details, feed one end of the body wire up through a bead and pull your bead down into the centre of your wire shape. Twist your oval shape to form the shape of a number eight (8). Keeping the bead within one circle, of the eight shape and twisting the wire tight (only one twist), to fit around your bead. Secure the bead to the wire at the neck area, by wrapping the wire piece (that you used to thread the bead) around the body shape and twist the other end of the body wire, in the same area. Use needle nose pliers to make the wire twisting easy. Once again twist your wing form into a number eight shape and twist the two ends of the wire, from the wing shape, around the body, to secure the wings, to the body section. Be sure to tuck all your wire ends into the neck area. To create the halo, thread about 12 seed beads onto a piece of wire, twist together, to create a circle of beads and secure to the body section of the angel, with the two strands of wire from the bead thread. Gently pull the loop sections of the body (keeping a finger within the loop, to keep from pinching the ends) and wings into a fan shape. Glue a rhinestone to the front of the angel (refer to photo for placement) and a pin attachment to the back of the angel. These additions help to hide the tangled bunch of wire beneath. More pictures or a video would be tons more helpful. Super hard for me to follow, as I’m more of a visual learner. I’ll keep trying! I hope you manage to work it out, Tanya. This is an older project, made before DIY videos were so common, but I understand what you mean. If I have a chance, I’ll take your suggestion and put together a video!